I was surprised to find a 767 going from Santiago to Montevideo on a Sunday morning. Could there be such an increase in traffic to merit the significantly larger plane than the standard A318? I wasn’t going to complain because there was excellent business class availability and it is equipped with the long haul lay flat seats. This was going to be a fun hop over the Andes. 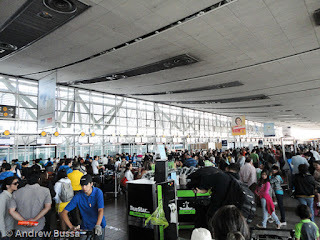 I arrived at Santiago airport and found a giant mass of people by the LAN check in desks. I looked for the business class desk, but couldn’t find it. I asked an agent and she directed me to the far end of the airport. 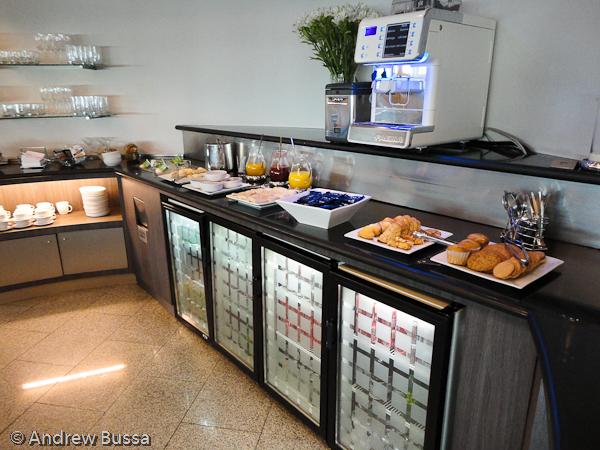 After I walked from one end to the other, I found the LAN international business class check in lounge. There was no line and plenty of people to help me with my flight. 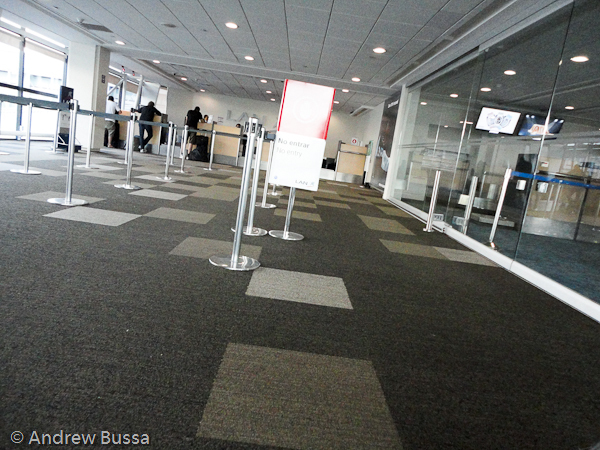 The space feels private and removed from the rest of the terminal, but that is balanced out by the lack of signage. 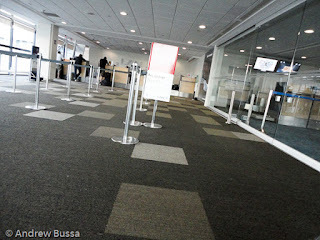 There is nothing really to do on the ground side, so I went into the customs line and then to security. The customs line looks long, but moves fast. There were a few Asian passengers that blatantly cut the line, but they didn’t respond to people’s comments in Spanish or English, so they got away with it. After customs and security there is the duty free shop. It’s large, but doesn’t have anything special. Most amusingly, the walk in humidor’s door was broken in the open position, so all the cigars were ruined (but still for sale). I wasn’t interested in shopping because I would be back in a day and have a long layover. I did grab some prices off the Scotch to compare with Montevideo. Both airports price items in USD making shopping simple unless you, like me, were in a habit of dividing by 500 to convert into dollars. 3000 pesos ($6) for dry Cuban cigars isn’t bad, $30 for the same broken cigars is a rip off. Looming over this trip was my 13 hour layover the next day. I didn’t want to see or do anything so I can have something new to see the next day. I quickly found the LAN VIP Salon lounge and grabbed a seat. The free wifi was lightning fast and there was a decent food and drink spread for mid-morning. The lounge was comfortable and quiet; I was the only tourist in the place. 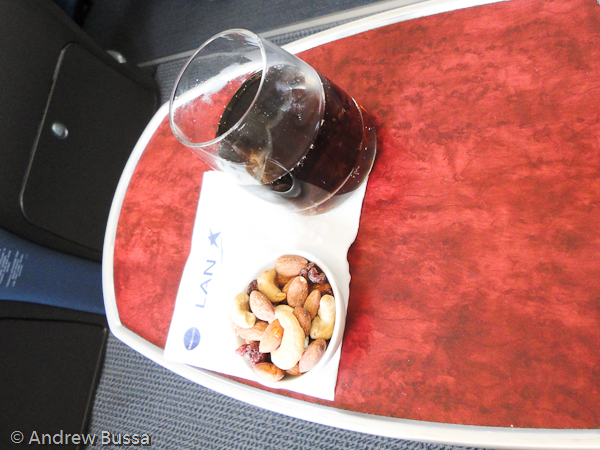 I enjoyed some surprisingly tasty finger sandwiches and a few Cokes while I caught up on email. I went to the gate a few minutes before boarding; SCL is a small airport so you are never more than 5 minutes from your gate. When I arrived, I saw the crew still in the gate area and settled in for another delayed LAN experience. When the boarding announcement was made, the gate agent started with families, but it was a tad messy because they had to fight their way, strollers and all, through all the other passengers lined up for boarding. When general boarding began, business class went first. The agent stopped me to put a gate check on my roller bag. I knew it would fit no problem, even in the crazy small 767 bins. Luckily he put the tag on the top of my bag, so I just placed my backpack on top of my bag to hide the tag. I boarded, tossed my bag in the bin and it was a non-issue. I was settled with a Coke and some nuts while the rest of the plane boarded. Late in boarding an American family of four sat down in business class and one of their grade school age children said “What is this Mom? 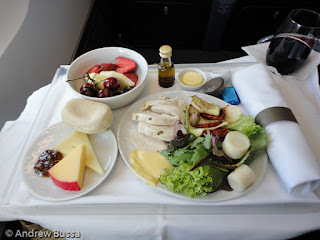 I thought we were sitting in first class.” Wow. Really, it was said as obnoxiously as you think. After my initial shock, I started laughing. The parents noticed and then explained to their son that not all planes have first and they were in the best seats on the plane. The explanation also made me laugh (I would have preferred a “be polite or sit in the back” style reprimand). 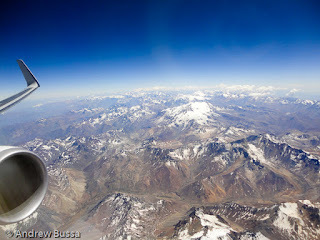 A few minutes after takeoff we were flying over the Andes. There was an announcement made to stay buckled up even though it was smooth sailing. There are some great views too and 15 minutes later, it was over and then came the plains of Argentina. After the Andes, a simple, but flavorful, turkey salad was served for lunch. The cheese plate was great as always, but there was mold on the fruit (gross, but noticed before I ate any). I substituted wine for fruit and vegetable serving. A gentle landing was followed by a quick taxi. I was first off the plane and first in line for customs. The customs agent was friendly and worked quickly. I grabbed a Champaign sample on my way through the duty free store after customs and found the taxi desk. I had less than 24 hours in Montevideo and I needed to make the most of them.